"On the establishment of the gubernias and cities assigned to them"
A governorate, or a guberniya (Russian: губе́рния; IPA: [ɡʊˈbʲɛrnʲɪjə]; also romanized gubernia, guberniia, gubernya), was a major and principal administrative subdivision of the Russian Empire and the early Russian SFSR. The term is usually translated as government, governorate, or province. A governorate was ruled by a governor (губернатор, gubernator), a word borrowed from Latin gubernator, in turn from Greek kybernetes. Sometimes the term guberniya was informally used to refer to the office of a governor. Selected governorates were united under an assigned governor general such as Grand Duchy of Finland, Tsardom of Poland, Russian Turkestan and others. There also were military governors such as Kronshtadt, Vladivostok, and others. Aside of governorates, other types of divisions were oblasts (region) and okrugs (district). This subdivision type was created by the edict (ukase) of Peter the Great on December 18, 1708 "On the establishment of the gubernias and cities assigned to them", which divided Russia into eight guberniyas. 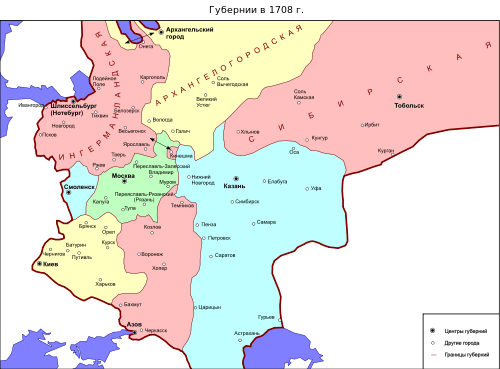 In 1719, guberniyas were further subdivided into provinces (провинции, provintsii). Later the number of guberniyas was increased to 23. The Governorates of Archangelgorod, Kiev and Siberia remained constant between 1708 and 1726. 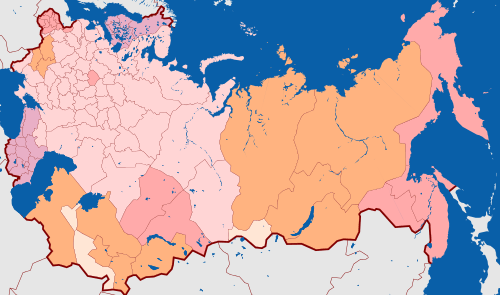 By the reform of 1775, subdivision into guberniyas and further into uyezds (уезды), was based on population size, and the term guberniya was replaced by the synonym of Russian origin: namestnichestvo (наместничество), sometimes translated as "viceroyalty". The term guberniya, however, still remained in use. These viceroyalties were governed by namestniki (наместник) (literal translation: "deputy") or "governors general" (генерал-губернатор, general-gubernator). Correspondingly, the term "governorate general" (генерал-губернаторство, general-gubernatorstvo) was in use to refer to the actual territory being governed. The office of governor general had more administrative power and was in a higher position than the previous office of governor. Sometimes a governor general ruled several guberniyas. By the ukase of the Russian Senate of December 31, 1796, the office of governorate general was demoted to the previous level of governorate, and Russia was again divided into guberniyas, which were subdivided into uyezds, further subdivided into volosts (волость); nevertheless several governorates general made from several guberniyas existed until the Russian Revolution of 1917. For the guberniya (Russian: губе́рния, Polish: gubernia, Swedish: län, Finnish: lääni) as subdivisions of the Kingdom of Poland ("Russian Poland") and the Grand Duchy of Finland ("Russian Finland"); see Administrative division of Congress Poland and Governorates of the Grand Duchy of Finland. For the guberniya (Russian: губе́рния, Ukrainian: губернія) as subdivisions of the Ukrainian People's Republic and the Ukrainian SSR ("Soviet Ukraine"); see Administrative divisions of Ukraine (1918–25). After the February Revolution, the Russian Provisional Government renamed governors into guberniya commissars. The October Revolution left the subdivision in place, but the governing apparatus was replaced by guberniya soviets (губернский совет). Actual subdivisions of the Soviet Union into particular territorial units was subject to numerous changes, especially during the 1918–1929 period. Because of the Soviet Union's electrification program under the GOELRO plan, Ivan Alexandrov directed the Regionalisation Commission of Gosplan to divide the Soviet union into thirteen European and eight Asiatic oblasts, using rational economic planning rather than "the vestiges of lost sovereign rights". Eventually, in 1929, the subdivision was replaced by the notions of oblast, okrug, and raion. In post-Soviet republics such as Russia and Ukraine, the term Guberniya is obsolete, yet the word gubernator was reinstated and is used when referring to a governor of an oblast or a krai. There is another archaic meaning of the word as the word denoted a type of estate in former Lithuania of the Russian Empire till 1917. ¹ Italics indicates renamed or abolished governorates, oblasts, etc on 1 January 1914. ² An asterisk (*) indicates governorates formed or created with renaming after 1 January 1914. ³ Ostsee or Baltic general-governorship was abolished in 1876.